Looking for a fun way to document your summer travels — or any memorable occasions, for that matter? 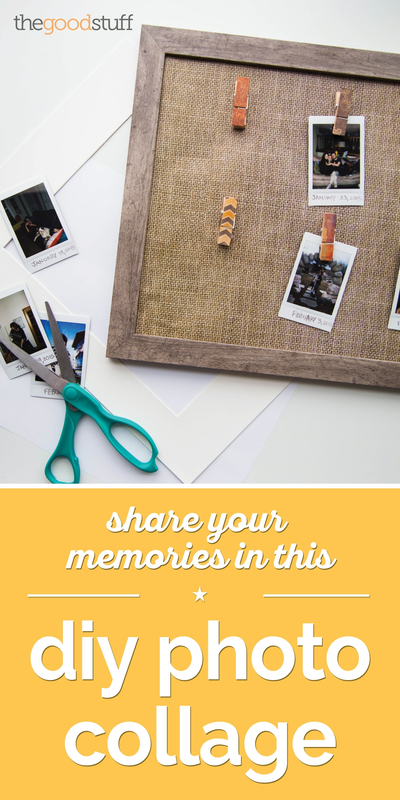 This simple DIY Photo Collage makes clever use of a frame and a few other simple supplies to make a stylish, chic showcase for your sweetest memories. Selfies aren’t just for teens! Learn how to snap the perfect selfie (no duck lips necessary) with our easy selfie guide featuring tips from professional photographers! A great way to repurpose old frames, feel free to use the stuff you’ve got lying around in the basement, or hit the craft store and purchase an inexpensive frame that goes with your décor. You’ll also need wrapping paper, leftover fabric scraps, or a roll of corrugated cardboard for the decorative lining in your frame. A pack of wooden clips is also needed — purchase basic clips for a budget-friendly project or hunt for colorful painted clips in the scrapbook section of your local craft store. This recycled wrapping paper comes in several different bold colors, and who could say no to these adorable wooden clips? You can find more supplies like this and save with Amazon coupons and Michael’s promo codes! Whatever your style, go with the flow! I got inspired by the boho style of the polaroids my daughter took last summer, so I put together a natural-looking collage to reflect her hippie vibe. But, if your house is clean and modern, a white frame, galvanized sheet of paper, and white clips will look incredible. Or bring back the fun of your vacation with bright, sunny colors — a teal frame, colorful liner, and bright colorful clips will give your craft a tropical vibe. No matter how you decorate it, this simple craft is a fun way to show off your style — and your favorite photographs. Here’s how to make it. It takes just minutes!